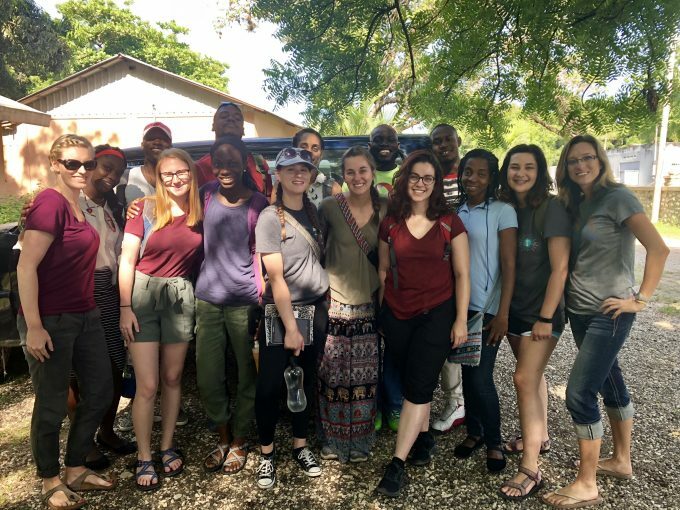 The Department of Environmental and Global Health (EGH) is proud to offer the first study abroad program in Haiti for undergraduate students at the University of Florida! 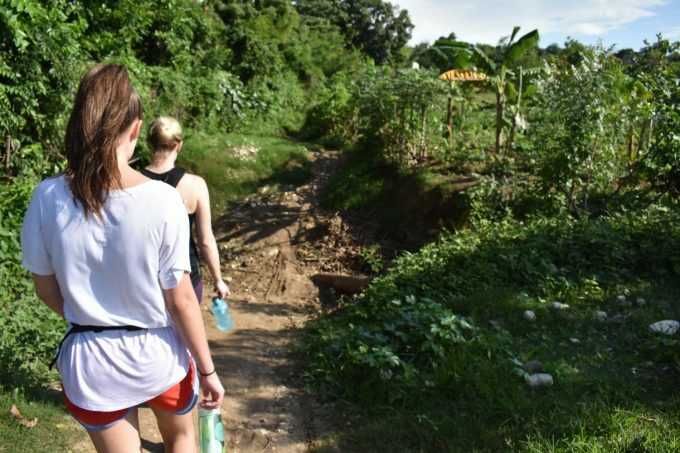 Caitlyn Parente and Dr. Liz Wood hike through the Haitian countryside during data collection. 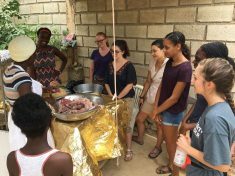 UF students learn to cook traditional Haitian meal from locals. This Summer A, eight undergraduate students from various disciplines and majors around campus had the unique opportunity to work alongside EGH faculty members conducting hands-on research surrounding water insecurity in Haitian communities. Students were joined by Dr. Liz Wood, Dr. Anthony Maurelli and Dr. Joe Bisesi during this 4-week study abroad program as part of an on-going research project managed by Kelly Chapman. 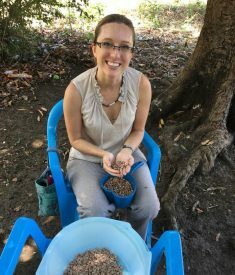 Ms. Chapman is currently completing her PhD in Anthropology, but she began this research project in 2016 while she was completing her MPH degree. Students were based in Gressier, completing much of their work in Léogâne and visiting other cities in Haiti, as well. UF faculty, students and Haitian staff take a quick photo before taking off for field work. The goal of the study abroad program was to provide students with the opportunity to learn public health skills and knowledge through interdisciplinary practice in a setting where global health challenges persist. Students practiced research methods in the field and contributed to efforts of local host organizations. Kelly Chapman, PhD student in Anthropology, during interviews. Throughout the program, students were able to observe and probe water insecurity surveys alongside Haitian researchers who acted as survey enumerators. They engaged with local community members during ethnographic interviews and collected water samples throughout the communities with guidance from EGH faculty. To better understand and appreciate Haitian culture, students visited the National Museum of Haiti that catalogs the nation’s history, Jacmel, Gainesville’s sister city, Port au Prince, the capital of Haiti, and Basin Bleu. Aside from research, students experienced Haitian cooking courses, outdoor hikes and the beautiful beaches on the island. 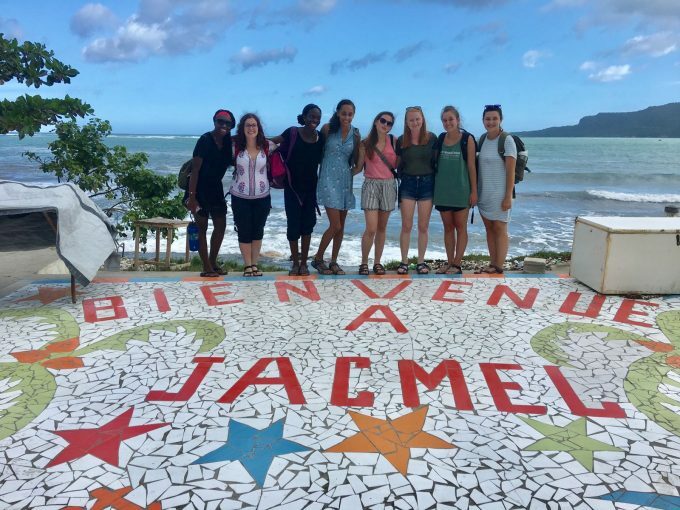 UF Undergraduate Students (left to right) Geneve Simeus, Marina Martinez, Mockelaux Bonzongo, Alina Merceron, Nicole Myers, Celest Dale, Caitlyn Parente, and Carla Ramsey visit Jacmel, Gainesville’s sister city.